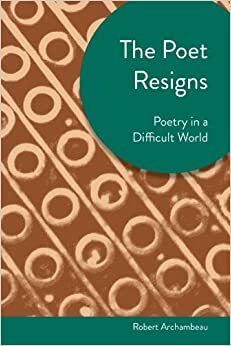 My review of Archambeau's The Poet Resigns: Poetry in a Difficult World is available in the print edition of Pleiades. "Trivedi cuts to the core of the book when he says that its central question is "What is the role of poetry in contemporary society?" Trivedi says some kind things about the book, but personally, I feel The Poet Resigns only starts to answer that question. I'm hoping the critical book I'm resolving to finish in the year ahead, Making Nothing Happen: Poetry in Society, Poetry for Itself takes things further. And in a way I'm kind of hoping a future reviewer will find a way to link that book to the Danny Devito oeuvre, too." I think the central question of the review, on the role of poetry in society, should be an existential question for any poet. Speaking broadly, should this not be the question everyone asks of themselves, whatever their profession might be? I can't imagine that most people spend their time asking such questions of themselves, even if they are perfectly happy to ask a poet what the point in writing poetry is. Agreed, however, that The Poet Resigns seems to only partially get into this question, but at least it asks the question to begin with. I am unsure how other poets view their role within the poetry counterpublic but I think many poets see poetry as vital to society, a society that neither asks for nor particularly welcomes reflection on its workings. Of course, importance within the counterpublic is very different than importance beyond that, into the general public. In the review, I feel like I do a decent job of drawing a line between the poetry writing/reading counterpublic and the general public, for whom poetry seems to have stopped in 1956 or so. Reflection and commentary is, I think, the role that poetry can play in society, though I wonder whether that's of interest to many writing today. A poet for a destitute time indeed. I imagine many would take issue with my using the term "counterpublic" to refer to the poetry community. We are very nearly the exact definition of a counterpublic: a group marginalized by society that has created its own public sphere, specifically one within academia, which is its own counterpublic, no matter how many more first-year college students are admitted at various universities per year. Anyone who might take issue here might well feel that the role of poetry in society has only diminished because of the academic writing community. However, I would argue that the role of poetry was already diminishing at the point where academia stepped in to salvage whatever was left.